A guy can only handle so much time on the ground. I think I know how it must feel to a bird to be confined to a cage. That is . Free air is good for the spirit. 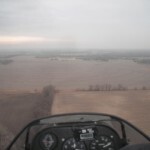 Although I far more enjoy flying in the Spring, Summer and Fall around here, I will get up in the air during the Winter months if I can pull it off. For me the limiting factor is the condition of the field. While we do have some snow around here on occasion usually that is not the case. Mostly, if it snows at all, it will snow for a short bit and then melt off leaving ice, isolated snow drifts and mud. Since I fly off a grass field this is a problem because my main gear can throw water and mud up under my wing. That can be solved by cleaning off the underside of the wing, of course, but there is a worse ramification that tends to keep me grounded when the field is wet. Since I have a rear facing prop, objects can be picked up by my main gear and thrown into it. A piece of mud into a prop is probably just as bad as a rock so I don’t want to risk it. I bought some wheel pants and was all fired up about installing them in order to fix this problem. Since I got them, though, and have seen all the effort involved in the installation I have temporarily cooled my jets. If/when I do put them on I will be posting the pix here. I had it set in my mind to take some aerial shots so you could see how different my area of Kansas looks in the Winter. Unfortunately the shot above is the only one that I was able to take. Ace Cameraman FitzGerald took off Saturday with a dead camera battery. I took this one shot and the pocketcam window started blinking red. Lights out! I was not impressed with my behavior… Next time I will be prepared better!